Condo, 3 Bedrooms + Convertible bed(s), 3 Baths, (Sleeps 10) Sat to Sat rentals. This BEACH FRONT, three bedroom penthouse is situated in one of Panama City's Finest RESORTS, Long Beach. Every room has a spectacular floor to ceiling view of the Gulf of Mexico and its sugar white beaches! We are located in Tower IV on the 14th floor (top floor). Rates Vary. Inquire for your weeks rate. We rent Saturday to Saturday! The living room and dining room have a cathedral ceiling and opens onto a 270 square foot, tiled terrace overlooking one of the world's most beautiful beaches.The entertainment center houses a TV/DVD/HBO. The spacious terrace has a dining table and chairs and two chaise lounges. The dining room table seats six comfortably and the kitchen bar seats an additional two. Pets are NOT allowed, No Smoking. All bedrooms have trey ceilings with fans, full bathroom with double sinks, and a TV. The master bedroom is furnished with a king-size bed and the second bedroom has two queen-size beds. The third bedroom, furnished with a cali king size bed & Full size Loft Bed. The third bedroom also has its own private terrace. The large laundry room has a super sized washer and dryer and a deep sink. This penthouse is on the top floor which is the 14th floor. Very fast elevators! Email LBR1401ataol.com for current rates. Our family has vacationed in Florida for many years and Panama City is our favorite destination. The condo offers floor to ceiling windows with a spectacular view of the gulf from every room. The spectacular view from the balcony is our favorite feature of the condo. The white sandy beaches and emerald blue water is breath taking. We also like being centrally located for shopping and enjoying a relaxing dinner at local restuarants. Just steps from elevators to beach! Awesome! Low step showers in 2 bathrooms. This is by far the best condo we have stayed in. Everything that we needed was there! It was clean, up to date and comfortable. Jim was very helpful and always replied to emails promptly. I would recommend this condo as we will be booking again. We stayed Sept 2018 for a week. They even have toys and chairs others including ourselves left behind for future families. 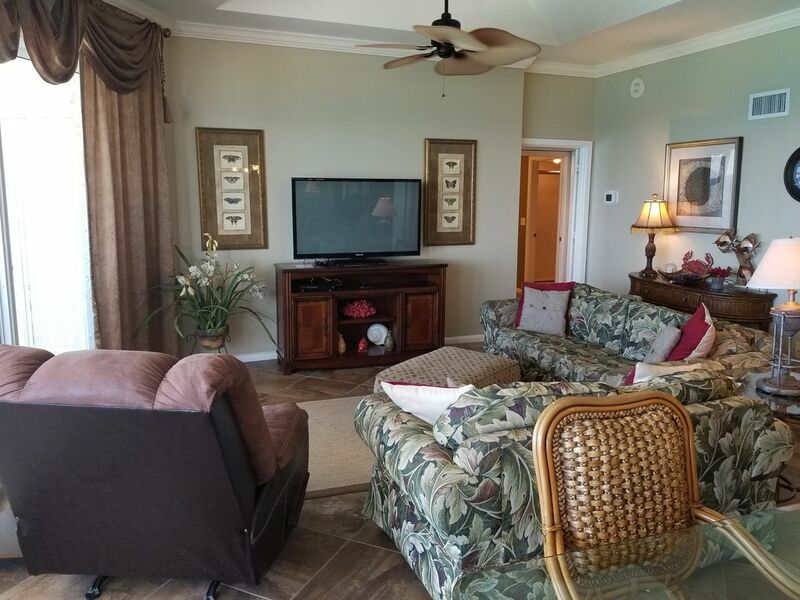 The condo is beautiful and has everything you need to relax and enjoy your vacation! Jim was great too! Will definitely be back! Thank you for renting your beautiful place to us. Has everything my home has and more with the views! Views are exceptional from every room. Thanks so much we will definitely return! The condo and location is great! By far the best unit we have stayed in at Long Beach and working with Jim (the owner) was so easy. Everything you could need is in the condo. Great views and quiet being the top floor. Highly recommend! Highly recommend this condo! It was clean and comfortable. Perfect for our family vacation. This condo was on the 14th floor. The elevators were quick. Never had to wait more than a minute. its a corner unit with two balconies. Only one elevator ride and a short walk to the beach! And the beds were so comfortable! Highly recommend! Rates are subject to change inquire for your weeks rate.